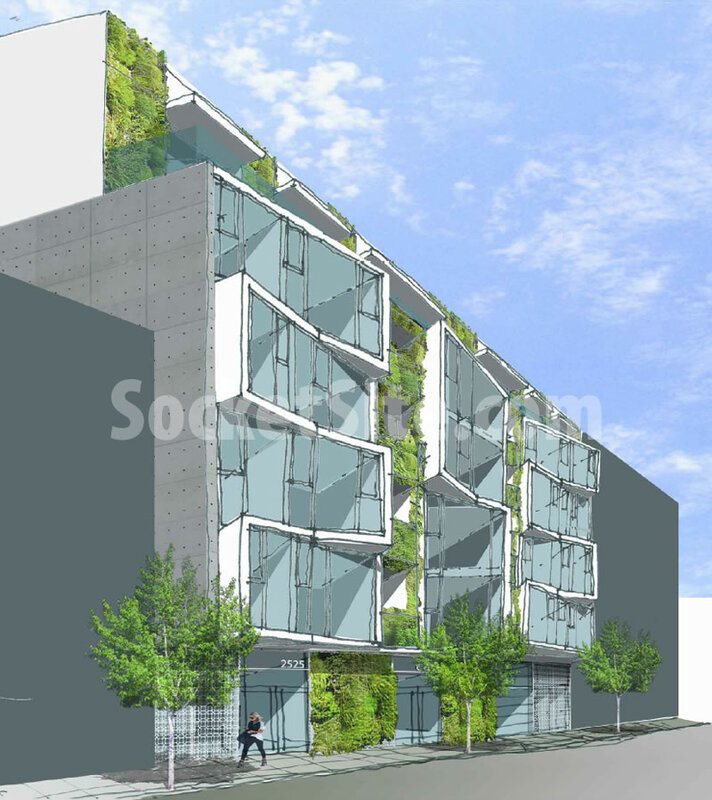 As envisioned by NC2 Studio for Vancouver-based developer, the Executive Group, the development will include 27 condos over 1,500 square feet of new café/retail space fronting Van Ness Avenue and an underground garage for 27 cars. And the application for the project’s environmental review has been filed. Caltrans — forever stuck in the Eisenhower era. Big Bubble Site, very appropriate! “BAY” windows have a long established 3 foot overhang rule subject to certain dimensional requirements. Not saying its the right plan, bu every architect should know this. Developers never want to trade off buildable area by pushing building back and having more “sculptural” details. Which is why so many buildings have shallow, flat, no texture no shadow window walls, other then somewhat gratuitous “bay windows”. Would surprise some people, but developers routinely grind a few inches out of wall thickness to get a small increase in rentable or sellable area. Basically building economics cast aside aesthstics in a very high cost environment with very restrictive zoning rules limiting height, floor area, lot coverage etc. Dear Planning Commission: Keep out of design issues. This is an interesting idea, and I believe that bay windows are, in fact, allowed to hang over up to 3 feet beyond the front property line. Cal Trans needs to step aside as well. I don’t think Planning has an issue, though I have a feeling those bay windows don’t conform to the bay window requirements. well you’ve bungled at least 2 things in your first sentence – for once, this isn’t the planning department proffering subjective design feedback, it’s them noting an objective requirement imposed by someone else; and, per that requirement (and as stated in the article), bay windows are *not* allowed to encroach into the US highway ROW. as for CalTrans “step[ing] aside” – what exactly do you propose? – that those streets no longer be part of US 101? (and if so, where would US 101 be routed?) – that the city take over all aspects of planning and maintenance of US 101? (because we all know what a great job the city does with its other, existing responsibilities.) – shall we just burrow 101 underground, at a cost of billions, and turn Lombard and Van Ness into pedestrian-friendly woonerfs (or whatever is the design-charette-idolized-idea-du-jour)? 1. You can be sure that Planning is still involved in this, I suspect talking (at least) with the out of touch Cal Trans officials. So yes, Planning is part of the discussion. 2. Cal Trans should have No place in this very minor issue. It’s quite ridiculous that Cal Trans has any voice in whether “bay windows” encroach or not over a so called US highway. What next? Cal Trans is going to take away the trees and light poles that “encroach” as well? Now that I’ve said that, why is your commentary so full of hyperbole and fear projection? Futurist, you have no idea what you’re talking about and you’re being a jerk in both of your posts, so you shouldn’t be surprised to get a hostile tone in response. The fact that it’s US101 means Caltrans owns that land, not the city. They have rules about what can happen on their land, rules that allow public uses like streetlights and trees and disallow private uses like balconies and bay windows. What needs to be done to take back Lombard and Van Ness from Caltrans? After VanNess BRT it really doesn’t make sense Caltrans to have any influence on these boulevards. well, from the article, sounds like it’d involve removing the designation of US 101 from Van Ness and Lombard. Of course, US 101 has to go somewhere (what with needing to connect the GG Bridge to points south), so I’m sure everyone from Congress down to the city planners would be happy to hear your alternative proposed routes. How about we move it to an elevated freeway? You mean that elevated freeway that connects the GG across SF to 101 south of the city? Yup, been on the books since ’56. I agree.The Planning Dept is ruining, block by block, this special city. We need great creative design!! Come on people! Have you ever been to any metropolitan cities in the US or Internationally. We are absolutely the design joke of the world right now. No we’re not. Planning is not ruining anything. This is a creative design. The amount a bay window or other projection can project beyond the face of a building is only limited by the architect’s and the structural engineer’s imagination. The amount a bay window or other projection can project beyond a Property Line in San Francisco is defined by the SF planning code. Here it appears that Cal-Trans has jurisdiction over Van Ness and Cal-Trans doesn’t allow any projections into their right of way. We are assuming that the front property line of this lot is also the Cal-Tran right of way, but someone may want to research that. The Cal-Tran right of way may be a defined width that lands somewhere in the sidewalk on Van Ness. But remember that Cal-Tran is one of the most well lubricated greasy pigs to pick a wrestle with, so you want to choose your targets carefully. Also, please visualize that if these bay windows are allowed to project into the Cal Trans right of way, it would technically by precedence validate a solid wall of bay windows projecting over the concrete block sound walls along many more miles of Highway 101. The Caltrans ROW does go to the back of sidewalk on Van Ness Avenue. Anyone who’s dealt with getting Caltrans to bring their design guidelines into 21st century standards for pedestrian accommodation knows that they’re not gonna change unless there’s a big political push. So no big surprise they’re stalling on this encroachment issue here too. My guess is this restriction is related to accommodating infrequent extra wide loads and probably also affects the minimum height of overhead wires too. Don’t know why SF keeps insisting on having the 15′ setback on the top floors for these mid rise buildings. It’s the top floor, instead of setting it back and giving up valuable rentable sq ft, allow for private terraces on the roof that is exempt from the height limit. Is it really true that no building on Van Ness has bay windows that encroach on the sidewalk airspace? That can’t be. As for Caltrans, how could it possibly matter if a building hangs over a bit of the 15-foot wide sidewalk? It wouldn’t be all of Van Ness, only 101 – hence south of Lombard, and before the Central was truncated and 101 rerouted, north of Golden gate or so; and of course there would be all kinds of buildings built in the teens and twenties grandfathered in. That having been said, and not to question SS’ expertise, but I wonder if the rule isn’t more complex: what about San Francisco Towers @ Pine? It’s possible the building is set back, but it certainly LOOKS like the two end bay windows protrude. 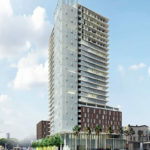 I am not an expert on this, but they have to move the building back so it doesn’t reach over the property line – it is common practice; once Caltrans (or a railroad or anybody else) buys the right of way they are not going to let anybody encroach on it… planning commission is pointing out the obvious. I was looking on Google streetview at 1501 Greenwich at Van Ness. It has bay windows, but it appears that the rest of the building is indeed set back to make room for them. set building back 10 feet, and allow them to go up 4-6 floors on the upper portion as it looks to short in the back, perhaps a more vertical upper floor will balance the set-back at street side vs. a conc. and glass wall, make a nicer front entry green-horizontal scape, that provides seating, and front entry layering…. (screened but protective, but open portions for community amenity and “socialization” maybe even a plug in zone for a street-cart vendor for the mission area? and you have a decent project. Masala Chai vendor cart, or a nice fruit/veggie/bagel/coffee morning kiosk?